If you grew up in the 1960s or 1970s, it seemed like there was a spaceship launch every week. A rocket was followed by a plume of smoke, and off the brave astronauts would go into the unknown, possibly bumping into God. Launching a spacecraft is one thing. Bringing it safely back to earth is another kind of business. Launch and re-entry have been on my mind quite a bit this past month when Anna returned from her first year of college. As Ken and I launched our girl into higher education last August, the venture made nervous astronauts out of the three of us. It was a bit of a bumpy start, but that did not last too long and soon enough, Anna was orbiting her new world 300 miles away. She had a successful launch and last month, we all had to reverse course for her to re-enter our atmosphere. Depending on your perspective, this return was either a setback or a simple change of venue. I’d say it was a little of both. Just as spacecraft re-entry can be a very tricky business, so is getting your college freshman acclimated to home life again. Note that when an object enters the earth’s atmosphere it experiences a few forces, including gravity and drag. Gravity has a natural pull on an object and will cause the object to fall dangerously fast. Think of this as your college freshman reluctantly comes back to home life, reacting to the natural yet disturbing force of your parental gravity. Moving back home can prove to be a challenge for college students. The earth’s atmosphere contains particles of air that a falling object hits and rubs against as it descends to the earth, causing friction. The object experiences drag or air resistance, which slows it down to a safer entry speed. You and your returning freshman will have your own version of friction. True enough, your child will experience drag and air resistance, but in the end will not be happy to adjust her life to a safer entry speed. Again, take a lesson from physics in understanding that friction in relationships is, at best, a mixed blessing. In addition to causing drag, it also causes intense heat. In researching the particulars of space-shuttle descents, I came upon some physical realities that make re-entry safer, and in the case of a college student returning home for the summer, a bit smoother. Any astronaut will tell you that re-entering earth is about attitude control. In the case of space flight, this is not a psychological term, but instead refers to the angle at which the spacecraft flies. I submit that similarly adjusting one’s view of welcoming your college student back home also has to do with attitude control. You and your child are in your own private descent back to family life, and how you adjust the angle of your relationship is the key to success. Don’t make a rookie mistake and think that loving phone calls and happy Skype sessions while your child is at school will translate into a seamless transition back home. In reality, we parents are the ground crew to our children’s ongoing launches. You and I both know that she’s still under heavy parental support, but it doesn’t feel that way to a daughter who has been in charge of her own schedule for the past nine months. Your child believes she is a high-flying adult living on her own. We can cull further lessons on our kids’ return to home life by understanding the descent of a space shuttle. In order to leave its orbit, a spacecraft must begin the process of slowing down from its extreme speed. The parties, the 2 a.m. pizza call, the constant flow of company, all of that comes to a screeching halt back at the ancestral home. Just as a spacecraft flips around and flies backward for a period of time to slow down, your college student will need to thrust her life out of orbit to return back to your home base. The descent through the atmosphere can be a bumpy ride. Once a spacecraft is safely out of orbit, it turns nose-first again and enters the atmosphere in a position akin to a belly flop. The nose is pulled up to what is called an angle of attack, which stabilizes the descent. The lesson to learn here is that friction is inevitable and even necessary to guarantee a safe landing. Landing a space shuttle today is a lot different from landing one of the Apollo missions, of my childhood. 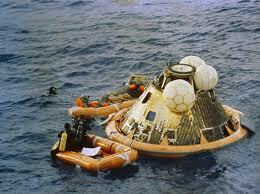 In those days, the astronauts returned to earth in their command module and made a dramatic splash in the ocean. Today’s shuttle lands more like an airplane and glides into a landing strip, deploying a parachute to slow it down. In the end, does the re-entry of your college student look like the big splashdown of one of the Apollo missions or is it the smooth computer-assisted glide of a shuttle landing? We’re still working it out at our house, and the return back from dorm living vacillates between the two, feeling as mysterious as the heavens. I would love to see an article written by the astronaut after she has spent the year out in the universe and how her adjustment back to same old Earth is from her perspective!!! Splash down, again and again and again…thanks for a great post!